An experienced customs officer of twenty-two years standing, Jon Frost served as a HM Customs Preventive Officer in London airports, an Operational Intelligence Specialist, an Investigation/Surveillance Specialist (Drugs), an Anti-Corruption Manager (Overseas) and National Intelligence Co-ordinator, and a Investigation Specialist for SOCA (Serious organised Crime Agency). He is also experienced in Army trained covert surveillance (CROPS) for the long-term observation of criminal gangs and operations, and was an Anti Fraud squad senior officer. He was involved in two record drugs operations hauls and also the first DNA-based evidence case brought by HMCE. Jon Frost trained and managed the covert investigation teams for HMRC that were responsible for the two single largest seizures of attempted importations of both cocaine and heroin. He was the case officer on HMRC’s very first DNA- based conviction. He has managed the intelligence between two leading UK law enforcement agencies and overseas agencies for SOCA, creating data intel up to top security level. For many years, I had friends and family encouraging me to write about my time in law enforcement. Finally I surrendered to their wishes. The next step was to flaunt my rough writings to a few agents. I couldn't believe my luck when Andrew invited me down to London to meet him and sign up with his agency. There is no doubt that Andrew's reputation as a top agent is very well founded and it is always a pleasure to work with him. Big Talk have optioned the memoirs of customs officer Jon Frost Anything to Declare? 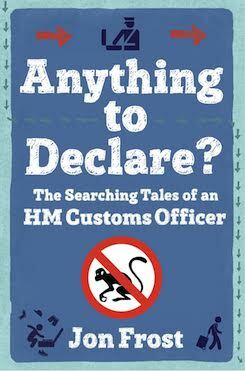 : The Searching Tales of an HM Customs Officer recently published by Constable. There’s a terrific review of Jon Frost’s Anything to Declare in the Daily Mail today.